Home Subscriber Only Cover Story Can a self-described ‘pro-growth progressive’ mayor boost investment in Providence? Can a self-described ‘pro[business]-growth progressive’ mayor boost investment in Providence? TAKING THE LEAD: Providence Mayor Jorge O. Elorza says he’s proud that the Providence Police Department was the first in the state to adopt body cameras for its police officers. He said the program has been well-received, adding it helps to calm people down because they know they are being recorded, while also allowing “the entire picture” of an incident to get out. Vincent A. “buddy” Cianci Jr.
Nice words, but the proof will always be seen in concrete actions Elorza takes to improve the city. So far he has shown not very much and avoids making the tough decisions without checking the way the wind is blowing! 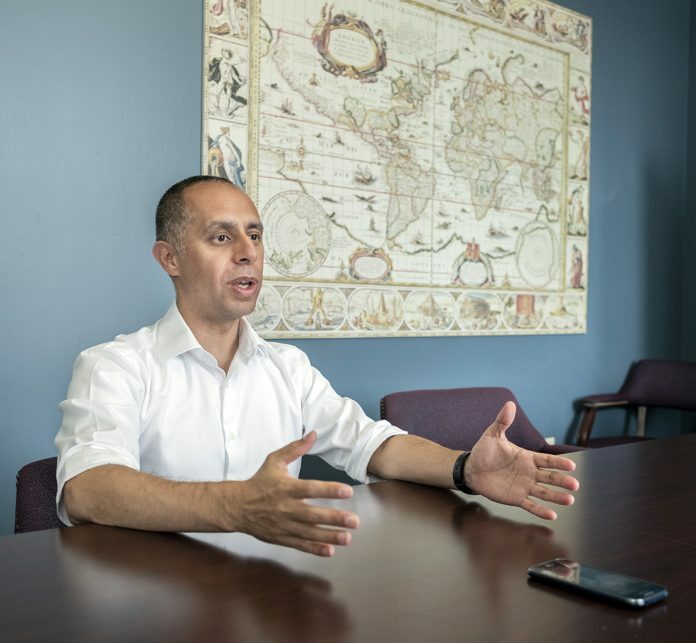 His attitude toward the proposed Paw Sox stadium, his non support of housing initiatives like the Fane tower, his lack of broad ideas and any vision or boldness speaks volumes about Elorza. it hard not to get away from the notion that it’s Amateur Hour in the Providence City Hall.